In this ever faster-moving world, a growing number of people want access to a simpler more sustainable way of life, in which traditions and connections are not disparate things. Furniture maker Charles Shackleton, co-founder of the Vermont based company ShackletonThomas, provides an antidote with "The Naked Table Project," a series of weekend workshops where people make tables by hand from locally grown trees. At a recent workshop, Shackleton said the project's name comes from participants working with material that is completely exposed, with no hidden secrets. The natural characteristics of the wood and the individual personality of the person building the table transform it through the process. In the twenty-five years since Shackleton began carving pieces of furniture by hand, his interest in how people interact with the environment has been a constant, as has his enthusiasm for the outdoors. Shackleton grew up with an appreciation for a healthy land, and practices sustainable building at ShackletonThomas, where all the wood used to create the main line of furniture is certified sustainable. No doubt, he is influenced by his late father the Irish gardener David Shackleton and cousin the late polar explorer Ernest Shackleton. The Naked Table Project is an extension of Shackleton's passion for the outdoors, and interest in community as it relates to the greater world. "We gather people and go out and choose some wood and meet the forester and (experience) all of the chain of custody and have a weekend where we make tables and the next day a celebratory meal," said Shackleton. The idea for the project began forming when ShackletonThomas started making wooden bowls. "We had logs delivered by a trucking company and chopped up by chainsaw," said Shackleton. "I thought those logs came out of the local woods; why aren't we making furniture out of local wood instead of from the Allegheny Forest down in Pennsylvania? Why not harvest our own logs?" Shackleton started thinking about the form the project would take. He wanted to create furniture that looked like it grew out of the forest and for people to get a feel for that. "I wanted to do something that shows the connection clearly and you could also be involved in and meet people who are part of the creating," Shackleton said. "Never mind the family that sits around the table they built and in 100 years time all the corners are rounded off, there are dents, dings. It is a souvenir of life and history." Each Naked Table workshop involves working with a forester and landowner in that community. Thus far, workshops have primarily been in the Vermont/New Hampshire region where American Hard Maple, or Sugar Maple, is prevalent and native. "As we take the Naked Table Project to new communities, we are careful to keep our chain of custody as close together as possible," said Jeremy Zietz, Creative Director Shackleton Thomas. The most recent Naked Table workshop was held last weekend in the wild lands of the Northeast Kingdom in Vermont, where some of the farmers and food artisans who head up the region's farm-to-table movement are role models for a national audience of agripreneurs. Participants included Andrew Meyer, of Vermont Soy and Vermont Natural Coatings (the Naked Table Project uses their nontoxic whey-based finish in all their workshops), and Linda Ramsdell, owner of Claire's Restaurant & Bar in Hardwick, which pioneered the community-supported restaurant model. A Lutheran minister doing her sabbatical on tables, and a couple celebrating their 25th anniversary, were also involved. The first day was spent building tables and visiting a local farm and sugar bush, where there was a demonstration of oxen pulling a log from the woods. The second day, the food-loving crowd who enjoy knowing how their food is made and where it comes from gathered for a locavore community lunch with suppliers of the ingredients to celebrate the abundance of local food. 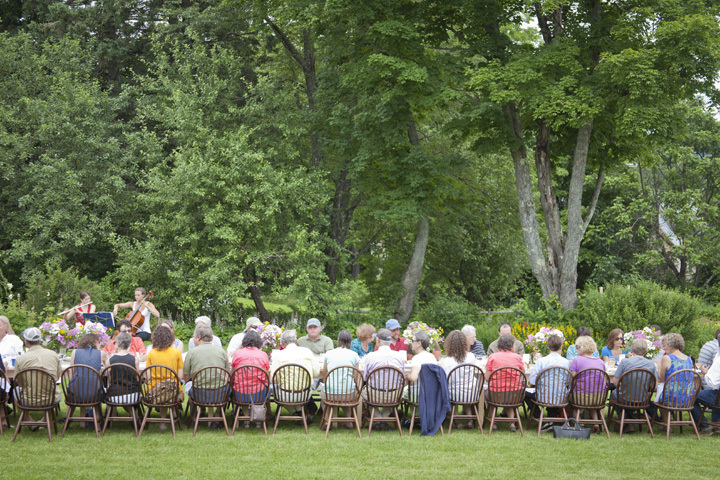 The tables built the day before were linked end-to-end smack in the middle of a beautiful outdoor setting. The day's menu was made of produce and meat sourced from local farms, bread from a nearby bakery, and cheese from a creamery located just down the road. relief effort in conjunction with the state to build tables for some of the families only now transitioning to homes after being displaced by Tropical Storm Irene almost two years ago. For information on a Naked Table Workshop go here. Top image by Jeremy Zietz. Bottom image by Linda Walsh.